The 28-year-old Bulgarian immigrant filmed kicking a woman down a flight of stairs last year in Berlin was sentenced to less than three years in prison after a psychiatric expert testified the man has an IQ of 63 and is therefor "intellectually impaired." The 28-year-old man who sparked internet outrage after leaked footage showed him kicking a woman down the stairs of a Berlin metro station has been jailed for nearly three years. Identified only as ‘Svetoslav S.’, the man was sentenced to two years and 11 months in prison after he was convicted of causing grievous bodily harm by a German court. 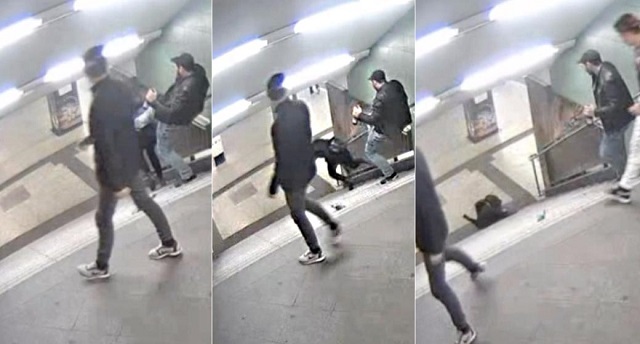 Police appealed for witnesses to the October 2016 attack by releasing footage of a young woman being kicked down the stairs of Hermannstrasse U-Bahn station. She suffered a broken arm and head injuries. Svetoslav admitted to kicking the woman in court, but maintained that he had no memory of the incident as he was under the influence of alcohol, marijuana, cocaine and crystal meth at the time. The Bulgarian apologized to his victim in court and insisted he only became aware of the incident after watching the footage online like everyone else. “I found it horrible myself when I saw it,” he said, reports Süddeutsche Zeitung. The sentence was less than the three years and nine months sought by the prosecution after Svetoslav has found to not have full control over his emotions or decisions. The court heard from his wife, who claimed the pair had fought that night, and Svetoslav had struggled to control his aggression and drug dependency since a car crash in 2008 left him badly injured. A psychiatric expert testified that Svetoslav suffered a serious head injury in the crash and had reduced culpability as a result of the alcohol and drug abuse. The expert also claimed Svetoslav had an IQ of 63, classifying him as intellectually impaired and unable to control his emotions. For context, a German man was sentenced to one a half years in prison for writing "xenophobic" posts on Facebook. In other words, in the eyes of the German justice system, kicking an innocent woman down a flight of stairs is equal to two sentences for "anti-migrant hate speech."